DeltaOne Software has crafted a simple, but comprehensive, inventory control module for the leading mid-tier accounting systems, allowing you to have the productivity and accuracy gains of a warehouse management system without its cost and complexity. DoubleCheck Live provides the missing functionality needed for today's warehouses. You get accurate shipping, multi-bin inventory, advanced inventory counting, and simplified receiving. Real-time inventory control for Sage and Microsoft accounting packages. DeltaOne Software has crafted a simple, but comprehensive, inventory control module for the leading mid-tier accounting systems. You can have the productivity and accuracy gains of a warehouse management system without its cost and complexity. DoubleCheck Live provides the missing functionality needed for today's warehouses. You get accurate shipping, multi-bin inventory, advanced inventory counting, and simplified receiving. DoubleCheck Live was designed with low skill or temporary workers in mind. The scanners require only a minimum of keyboard entries. Strict parameters on data entry prevent mistakes from occurring. Also, most transactions effecting general ledger accounts are placed in batches for review and recovery. Picking Verification: insures that the right items, in the right quantities are sent to right person. Picking errors not only cost you in expedited shipping, lost merchandise and time in handling returns, it also damages your company's reputation. 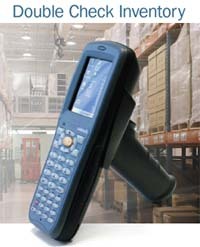 Errors can be greatly reduced by having pickers scan each item. Purchase Order Receiving: checks the items received against open orders. Items then quickly move into inventory. Also, the process verifies that the items are correctly labeled. Moves and Warehouse Transfers: allows for multiple bin and multiple warehouse operations even if your accounting software does not support it. Some accounting packages limit items to only one bin; and thus, they cannot track overstock locations. DoubleCheck Live provides multi-bin item tracking without special add-ons or alterations to your accounting system. Inventory Issues and Production Receipts: records inventory used and created by work orders. Physical and Cycle Counting: verifies the items are in the correct locations and the quantities that you have on hand. DoubleCheck Live supports counts created in your existing accounting package and will automatically update the counts. DoubleCheck Live also has its own physical counting processes that support sophisticated and specialized counting practices including blind counts, double counts, and counts based on past variances. Create / Edit Aliases: assigns barcodes and unit of measure information to items. DoubleCheck Live can use your accounting package's unit of measure information as well as its own conversions. Thus, you can track items packaged as pallets, cases, inner packs, or individual SKUs. Label Printing: gives the user the ability to print receiving and inventory labels from the barcode terminals.